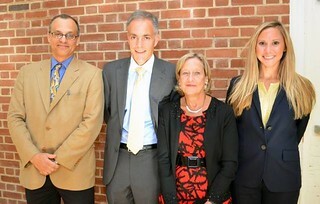 The College of Behavioral and Social Sciences at the University of Maryland did not celebrate the Constitution’s 226th birthday with cake or even with barbecue a la the Fourth of July, but instead hosted a panel of experts to discuss how the Constitution is keeping with and adapting to the digital era. Held on Tuesday, Sept. 17 in Stamp Student Union, “Constitution 3.0: Liberties and Technology” featured a panel of four experts: Robert Koulish, Irwin Morris, Diana Huffman and START’s own Elizabeth Petrun. Petrun kicked off the event by briefing the audience on START’s “Social Media Use during Disasters” report, which she related to issues of social media use, internet privacy and constitutional rights. Following the presentation, the panel answered questions from the audience and Twitter with their unique perspectives from the fields of law, government and journalism. “The types of issues that we touched on are things a lot of people have on their mind,” Petrun said, noting recent controversies related to Edward Snowden and Bradley Manning. Each year, the university’s College of Behavioral and Social Sciences hosts an event on campus to celebrate Constitution Day with a theme based around current events and issues. The 2012 Constitution Day event, “Election Dissection,” discussed how the Constitution plays into presidential campaigns. “Election Dissection” also featured a speech by former Congressman Dennis Cardoza, a 1982 graduate of the College. Following this year’s event, attendees received a free pocket-sized U.S. Constitution, a token to encourage them to revisit the founding document drafted 226 years ago. “I think we still have a lot of uncharted territory when it comes to state and federal regulation, and a sincere responsibility for protecting the rights of organizations and individuals in these matters,” Petrun said.